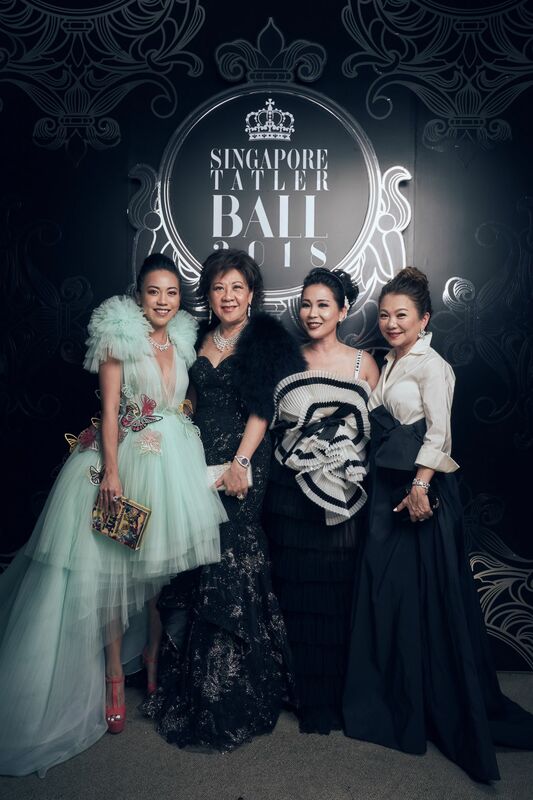 Achieving maximum impact with our 36th Singapore Tatler Ball, because why not? Maximalism was the theme for this year’s Singapore Tatler Ball, and in the spirit of “more is more”, gorgeous guests arrived at the exquisite Capella Singapore dressed in big, statement-making gowns, and sharply tailored tuxedo jackets with embellishments and bold patterns. Telling CNA Lifestyle, who was given exclusive access to cover the Ball this year, style maven Peggy Jeffs said, “If you know me, you’ll know that I always dress maximalist. My daughter told me to just go as myself.” Peggy's outfit of choice was a beautiful bespoke gold sequinned dress by Shanghai Silk House paired with a feathered headgear from Kristine Hakim, an Indonesian milliner based in Singapore. The bling spotted that evening did not disappoint as well. Diamonds and colourful gems sparkled from all corners of the room, with the likes of Serene Chua sporting an ostentatious Van Cleef & Arpels gold bracelet that was once owned by American-British film goddess Elizabeth Taylor, paired with jewellery from Tiffany & Co. and Bvlgari, while Chan Kok Weng wore an iced out diamond-encrusted timepiece by Audemars Piguet. Knowing the amount of #ootds, #wefies and other memorable pictures that would be taken at the Ball, we had a total of seven photo walls at the foyer of the ballroom, including our very own official Singapore Tatler wall. The other six walls were those of our amazing sponsors: Bentley, Lladro, Tiffany & Co, Hublot, MTM Skincare and Manulife. In between these photo spots, the Macallan bar was also open for business, with the bartenders shaking up a trio of specially crafted whisky cocktails. Just over 8pm, the doors of the ballroom opened, and the tune of Frank Sinatra’s The Way You Look Tonight playing from inside coaxed guests to enter. As they walked towards their seats, a “fallen” chandelier centrepiece greeted them as a deliberate attempt to encourage them to leave their inhibitions at the door and join the Tatler team to bring the house down. As everyone settled into their seats, our emcee, the charismatic Allan Wu, called upon Edipresse Media Singapore (EMS) managing director Corinne Ng to give her speech. Corinne not only thanked the guests for taking the time to attend the Ball, but she also expressed her gratitude to them for their generous contributions to EMS’ efforts to boost literacy in Singapore. These contributions resulted from many guests purchasing the Words Without Walls storybook that Edipresse Media Singapore produced with local non-profit organisation New Life Stories in 2017, and has since reached $35,000, which will go towards helping the beneficiaries of New Life Stories. Furthermore, Corinne also highlighted how maximalism was also embodied by eight amazing individuals present that evening—they were the recipients of the Singapore Tatler Awards 2018, and personalities who have shown incredible courage to push their limits and reach for greater heights. Dinner commenced shortly after, with live band Liquid Blue serenading the crowd with a medley of classic and modern hits. Fun fact: for the main course, we contemplated serving maple-glazed duck, which is best served rare, but decided against it as the dish might not sit well with all palates. As such, we went with our other option, the Westholme Wagyu beef, which was just as exquisite. At 9.30pm, the first part of the evening’s main highlight, the Singapore Tatler Awards ceremony, began. Receiving the first award, the Singapore Tatler Award for Culture, was Haresh Sharma, the immensely talented resident playwright of The Necessary Stage. The award for Style followed, with the ever-daring fashion maven Georgia Lee taking this crown. New Life Stories’ co-founder Saleemah Ismail took the next award for Community Service and gave a touching thank-you speech where she attributed her success to the collective efforts of her team and the big-hearted supporters of her non-profit. Concluding the first segment of the ceremony, the Singapore Tatler Award for Society Couple of the Year went to Adrian and Susan Peh, who attended the Ball with their three children and sprightly 91-year-old father. After a short break, EMS editor-in-chief Kissa Castañeda took the stage with Allan to begin the second part of the award presentation. The award for Philanthropy went to Trina Liang-Lin, for her contributions to society as the immediate past president of the Singapore Committee for UN Women and the co-founder of the Lin Foundation, which she started with her husband Edmund. Next up was the award for Business, which went to Arthur Tay, the charming personality helming SUTL Enterprise and the One15 Marina brand. With that, the award ceremony came to an end. Liquid Blue once again took the stage to signal that the dance floor was now open. At other corners of the ballroom, a hidden photobooth and a sumptuous dessert station were also unveiled. Unsurprisingly, guests continued to dance, drink and be merry until well after 1am, pausing only for a short while at midnight to savour a serving (or three) of teochew porridge, the beloved Tatler Ball version of supper.